MIAMI, FL – His Eminence Archbishop Demetrios Geron of America unexpectedly left the Leadership 100 conference in Miami, FL at 3pm on Friday, February 2 and returned to New York. No reason was officially given by him or any other representative. The Archbishop’s departure raised many questions and led to many comments and suspicions. The Archbishop was supposed to participate in the entire conference and celebrate the Divine Liturgy at St. Sophia Cathedral in Miami on Sunday. The Finances of the Archdiocese and also the rebuilding of the Saint Nicholas National Shrine Church at the World Trade Center dominated at the 27th Annual Conference of the Leadership 100. The Conference was convened at the luxurious Ritz Carlton Key Biscayne Hotel, in Miami from Thursday, February 1 to Sunday, February 4. With great pride, Tsandikos and Kirkos announced that despite having gone through very difficult times, things are really getting much better. First they went through the long litany of all the problems that they found and which were allegedly hidden and discovered recently. Then, they reviewed the improvements to internal systems et al, and the layoffs etc. Then the delegates were told that for the first time, the Archdiocese was “in balance” for the past month, i.e., receipts exceeded expenses slightly and that they were able to pay all current bills, with a little bit left over. They also stated that this does not address the “Legacy Debt” which annoyed people a little since the term makes it sound like the Archdiocese inherited the debt rather than having created it. The big revelation was that they were able to achieve this “good financial” situation because 34 churches in the archdiocese prepaid their 2018 commitment in late 2017. Then there were questions about St. Nicholas. They categorically stated that St. Nicholas will be completed although they did not have information about when or what the total cost will be. They did say that they had to hire a security company to protect the work site so that it is not vandalized or damaged. They also stated that probably $20 million had been spent before construction had even started. They claimed that there were big legal costs and Calatrava-related design costs and that probably only $17 million had actually been spent on the construction and that we currently owe the construction company about $7 million. They were categorical that the church would be built but when Mr. Tsandikos was asked details about the contract and if we were at risk of losing control of the property, he noted that he did not know the details of the contract. That was a very strange thing for Tsandikos to say since he is head of the Archdiocesan Council, head of Leadership 100, and a member of the Archdiocese Legal Committee which is addressing the contract. In addition to the Archbishop, Metropolitans Nicholas of Detroit and Savas of Pittsburgh were in attendance. 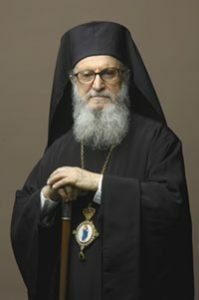 Metropolitan Alexios of Atlanta was absent from the conference in spite of the fact that Florida is part of his Metropolis. No explanation was given for his absence. There were many conversations among the Leadership 100 members about the inability of the Ecumenical Patriarchate to face the problems of the Archdiocese of America. Also there were conversations about how unbelievable it is that none of the Metropolitans knew what was going on at the Archdiocese. They claim that they were not given financial information. Some 320 Leadership 100 members participated in the Conference according to the list the organization distributed. I’m still waiting for the forensic accounting audit! Where did the money go? No explanation for Met. Alexios being absent and no explanation for Arch. Demetrios leaving early. More questions than answers. What a pathetic state of affairs. Lord have mercy. The chickens have come home to roost. The lying, cheating, abuse, fraud, waste of the Byzantine prince poseurs has been fully exposed. The archdiocese needs to dissolve and go away. They are toxic from top to bottom. The Diavolo rules in NYC. Clear out the Leadership 100. Obviously ineffective after many years. There may be faithful men among the members of L100 but in general the Church has established a bad precedent.